General Apple and Mac desktop news is covered in Mac News Review. iPad, iPod, iPhone, and Apple TV news is covered in iOS News Review. Older Macs are covered in Vintage Mac News. All prices are in US dollars unless otherwise noted. Did the EPEAT Environmental Registry Cave on Apple's Retina MacBook Pro? 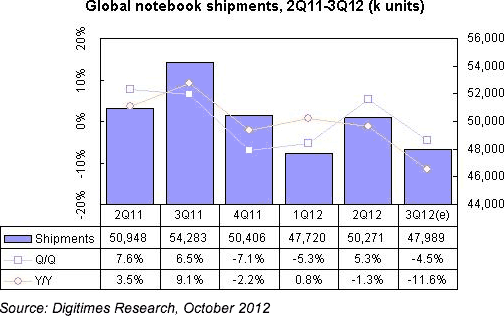 DigiTimes Research senior analyst Joanne Chien, reports that while the global notebook market as a whole suffered poor shipment performance in 2012's third quarter - with 4.5% drop in sales sequentially and 11.6% drop year-over-year, Apple roared through the the quarter with a sequential growth of nearly 30%, with its new and updated MacBooks (announced in June) receiving critical acclaim and good feedback from the market, and the company able to maintain a stable orders each month in the quarter. Chien attributes the downturn on the PC laptop side to inventory adjustments in retail channels and consumers' wait-and-see attitude to PC purchasing due to Windows 8's upcoming launch, noting that Acer, Asustek Computer, and Toshiba suffered the most severe shrinkage at 15-25%, with Asustek's previous ranking as the fourth-largest vendor worldwide falling to fifth. The Register's Alistair Dabbs notes the baneful truth that no matter how much storage space you get, and no matter how much you free up later on, it always gets stuffed to the gills, saying he's worried that he under-specified the hard drive in his new notebook at half a terabyte, which is all the SSD capacity he could afford, leaving him reliant on a couple of USB portable drives to manage data overflow. However, Dabbs says what's worrying him now is that "SSD storage probably isn't as rock-solid and reliable" as he had imagined, and that despite all the advantages that SSD enjoys compared with a spinning hard disk, it has one serious disadvantage (besides astronomical prices): "if something major goes wrong with the drive, the result for your data is nothing less than catastrophic." Adding to the grim outlook, Dabbs notes that Flash memory has a fixed lifetime, or at least decreasing performance over time. In the meantime, he observes, internal hard disks are getting easier and easier to swap out as well as cheaper and cheaper, leaving him wondering why he was "so stupid as to put all my faith in a storage technology that's so fragile, short-term and expensive?" Link: Why Is Solid-state Storage So Flimsy? Macworld's Martyn Williams reports that An EPEAT (Electronic Product Environmental Assessment Tool) investigation of five thin or ultrathin laptops made by four companies, including Apple's latest MacBook, has resulted in no products being removed from the EPEAT registry. However, it looks like the EPEAT folks have chosen to fudge the standard that had previously required products approved under the standard to be "upgradeable with commonly available tools" and arbitrarily decided that an "upgrade" doesn't necessarily require access to the inside of the computer, which has become problematical with recent Apple products that have proprietary Pentalobe screws fastening case covers, both CPUs and RAM soldered to the logic board, and batteries glued to the housing. Williams notes that EPEAT has decreed that so long as a product contains externally accessible ports, such as a high performance serial bus or USB, they are capable of being upgraded by adding a hard disk, DVD, floppy drive, memory, and cards and are now deemed to satisfy the EPEAT requirements for "upgradability". Macworld UK's Karen Haslam reports that Greenpeace isn't happy with EPEAT's revisionist rating of Apple's laptops, claiming that as a result of the green standards group's changes to the criteria, the world's electronic waste problem will grow, EPEAT's product verification committee having arbitrarily decided that being able to upgrade a laptop doesn't necessarily require access to the inside of the computer, declaring, "Products containing externally accessible ports such as a high performance serial bus or a USB are capable of being upgraded by adding a hard disk, DVD, floppy drive, memory and cards, and therefore conform to this criterion." Last June, iFixit called the 15" MacBook Pro with Retina Display "the least repairable, least recyclable computer [yet] encountered in more than a decade of disassembling electronics," what with super-strong glue fastening the battery to the chassis, hard-soldered memory, a proprietary SSD hardware interface and proprietary screws fastening it closed making it virtually impossible to repair, replace, or upgrade the laptop's battery, upgrade RAM, and so forth. That's why Apple voluntarily withdrew its products from eco-friendly consumer electronics EPEAT standard last summer, then did U-turn after a public outcry, even though the Retina MacBook Pro remains distinctly un-green - a clear case of what iFixit CEO Kyle Wiens calls "greenwashing." In a caustic essay, Wiens fulminates that giving the Retina MacBook Pro an EPEAT Gold certification renders the EPEAT "standard" essentially a bad joke - or at best, the interpretation of the EPEAT Gold standard laughably out of touch, for example claiming that Apple's proprietary Pentalobe screwdrivers are "commonly available tools" and deeming a USB thumb drive to constitute an "upgrade". At worst, he says, it may mean that recyclers a decade from now will be confronted with a mountain of electronic waste they can't affordably recycle without custom disassembly fixtures and secret manufacturer information. Wiens observes that the social and environmental price of manufacturing electronics is high, so it's critical that products last as long as possible, but Apple's products emphatically are not green thanks to its trending toward glued-together, essentially throwaway products with batteries that may fail after 12-24 months, and hardware designs that make repair so difficult that people rarely replace the batteries, opting instead to buy a replacement device. "Product shall be upgradeable with commonly available tools." "External enclosures shall be easily removable by one person alone with commonly available tools. Hard disk, digital versatile disc (DVD), floppy drive can be changed or extended. Memory and cards can be changed or extended." "Circuit boards >10 square cm (measured on the largest face), batteries, and other components - any of which contain hazardous materials - shall be safely and easily identifiable and removable." As Wiens observes, reasonable assessment would deem that a product assembled with proprietary screws, glued-in hazardous batteries, nonupgradeable memory and storage, and several large, difficult-to-remove circuit boards would fail all three tests. So a fudge was in, altering and watering-down interpretation of the standard to allow Apple's flagship laptop to clear the much-powered bar, and rendering EPEAT certification virtually meaningless. Where is the public outrage about that? Are consumers really so dense and gullible as to accept that what EPEAT has done really "fixes" anything, or are so-called "green" standards just an exercise in feel-good? ReadWriteWeb's Brian Proffitt notes that the computer industry's Electronic Product Environmental Assessment Tool (EPEAT) environmental standards program granting "Gold" status to Apple's Retina MacBook Pro has gotten a lot of folks angry, including both Greenpeace and iFixit.org, which have both accused EPEAT of watering down its standards to accommodate what they describe as Apple's decidedly non-environmental hardware. Proffitt notes that EPEAT is sponsored by grants from the Environmental Protection Agency (EPA) supplemented by annual fees from computer manufacturers based on a company's sales and revenue in an evaluated product's category, and that the Retina MacBook Pro has become an exemplar of Apple's avoidance of green standards, iFixit noting that there's a lot of glue to fasten the display, case, battery, and internal boards together, making the machine very difficult to service and recycle. In a blog posted this week, iFixit's CEO Kyle Wiens called Apple's Retina MacBook Pro "the least repairable, least recyclable computer I have encountered in more than a decade of disassembling electronics," and maintains that EPEAT's decision to certify the Retina MacBook Pro "Gold" - along with four PC ultrabooks - demonstrates that the EPEAT standard has been watered down to an alarming degree." Examples include accepting Apple's proprietary Pentalobe case closure screws as commonly available tools, deeming USB sticks as hardware "upgrades," and passing lightly over the sticky issue of the glued-in battery, which iFixit's teardown found was virtually impossible to remove without rupture and release of potentially hazardous chemicals. Proffitt also cites Greenpeace IT analyst Casey Harrell telling PC World that "Apple wanted to change the EPEAT standards when it knew its MacBook Pro with Retina Display would likely not qualify for the registry in July of this year - now EPEAT has reinterpreted its rules to include the MacBook Pro and ultrabooks," adding: "It's unclear why EPEAT caved in, but the impact is that EPEAT has confused consumers and businesses who want to buy green electronics that can be repaired and will last a long time, and sets a dangerous trend for the burgeoning market of ultrabooks." Proffitt also cites EPEAT spokespersons, including CEO Robert Frisbee, disputing that analysis, and arguing that standards must be kept relevant to rapid changes in hardware design, which sounds an awful lot to your editor like watering-down objective standards to accommodate design trends and fashions. But what do I know? Link: Did the EPEAT Environmental Registry Cave on Apple's Retina MacBook Pro? 9 to 5 Mac's Mark Gurman reports that alongside the smaller iPad mini, Apple will launch a 13" MacBook Pro with Retina Display on Tuesday, October 23rd, according to what he says is a consistently reliable source at a high-profile US retailer. Gurman says the word is that new 13" MacBook Pro will be sold in two configurations, made available for purchase soon after introduction and that the the current non-Retina display 13" model that was updated with faster processors and USB 3.0 in June will continue to be available as well, at least for the immediate future. In a separate report, Gurman says Apple also plans to announce an upgraded Mac mini in two standard configurations, with a third model that runs OS X Server to begin shipping immediately after announcement. Anticipated for the minis are Ivy Bridge CPU silicon and USB 3.0. AllThingsD's John Paczkowski says that wile the anticipated smaller iPad will be the star of Apple's rumored Oct. 23rd invitation-only event, sources inform him that a 13" MacBook Pro with Retina Display will be unveiled as well, projected to feature an ultrathin chassis, all-flash storage drives and a 2560 x 1600 resolution display. Paczkowski adds that there may be a new Mac mini announced as well, which would make sense since the current mini is long overdue for a refresh. The Register's Chris Mellor reports that Toshiba has joined Seagate and WD in offering a single platter 500 GB drive for thin notebooks and other compact devices, noting that the company's new MQ01ABF hard drive is essentially half of its MQ01ABD product - a 2-platter 2.5" drive with 1 TB capacity, and similarly spins at 5400 RPM, has an 8 MB cache and a 6 Gbit/s SATA interface. However, unlike the 9.5mm MQ01ABD drive, the MQ01ABF is 7mm in thickness and weighs 92 grams. Mellor reports that he MQ01ABF, which comes in 250 GB and 320 GB as well as 500 GB variants and has a low noise level and good vibration resistance, and is to compete with Seagate's single platter Momentus Thin (which offers a 7200 RPM 320 GB model along with a 5400 RPM 500 GB unit - both with a 16 MB cache) and Western Digital's 500 GB single-platter, 5400 RPM Scorpio Blue with 6.8mm z-height. WD's Hitachi GST subsidiary also offers a Travelstar Z5K500 with 500 GB on a single platter spinning at 5400 RPM and a 7200 RPM Z7K500 with a 32 MB cache. PR: Turn your laptop into a workstation with the Targus Chill Mat+ with 4-port Hub. 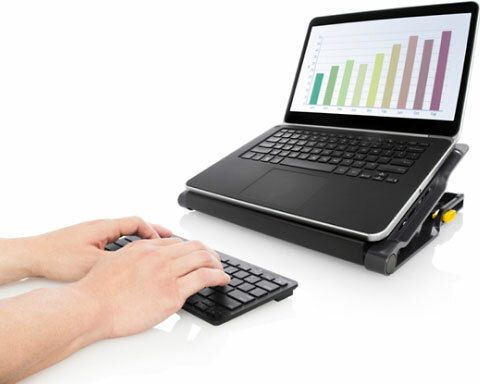 The Chill Mat+ combines a Chill Mat with its dual fans help keep your laptop running cool and a 4-port USB hub allows you to connect your USB peripherals, plus the unit's adjustable height allows you to use it as a laptop stand. Use it flat, or at the highest setting with an external keyboard for better line-of-vision ergonomics. To keep all your cables organized, Velcro straps help keep everything nice and neat. USB-Powered: Fans are powered using a standard USB connection that can be connected to your laptop or computer using a mini-USB cable. USB 2.0 Hubs: Includes a USB hub to help share the USB connectivity used to power the built-in fans. 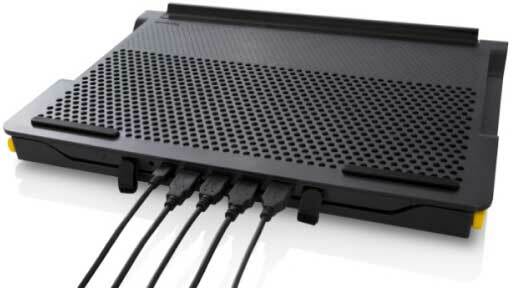 The Chill Mat+ with 4-Port Hub retails for $49.99 and is designed for laptops up to 17".